Biometric security in both access and payments is gaining popularity. Biometric verifications, such as fingerprint scans, have made cashless payments and access more secure, convenient and accurate. We are already accustomed to using our fingerprint to unlock our smartphones and to enter countries now, the same biometric verification is being widely used to open doors, enter virtual / online places and make payments. This new layer of security can replace passwords and pins that can be easily found and used by anyone else. However in some scenarios keeping a password but adding the fingerprint step as well may be preferred. That is for the issuer to decide. Taking BSOC to a new level is advanced security company MeReal Biometrics with a patented fingerprint smartcard. Traditionally a fingerprint authentication is carried out on a separate device such as a fixed reader. However, with the MeReal Biometrics card, the fingerprint authentication is carried out on the card itself and after a positive match the card’s technology is activated, the user has a short period of time to complete an action after which the card switches itself off and requires another fingerprint match on the card to perform the next task. The cardholder benefits from the convenience of always having their biometric sensor with them to use anytime and then they can simply place a finger on the card’s sensor before swiping, tapping or waving. No need to remember a password or pin, no need to sign a signature on a paper invoice. It’s quick and convenient. The sensor recognises the cardholder’s fingerprint in less than one second so it enables instant access and payments. With the MeReal Biometrics card, fingerprints from multiple fingers can be stored on a user’s card and each finger can have different privileges. That’s convenience. It’s becoming increasingly easy to copy pins, passwords and signatures and it is imperative for users to be protected as the threat of cyber security is on the rise. A lost or stolen fingerprint card is useless to another person. If their fingerprint does not match the one stored inside the card it will not activate its technology. A card requiring a pin or password can be used multiple times if stolen, however the technology on this card activates only when the fingerprint placed on the card’s sensor matches the digital fingerprint (algorithms) stored inside the card. Then the card can only perform its tasks for a limited time before it switches itself off. For the next action or transaction, the fingerprint verification will be required again. This reduces the risk of fraud and misuse. The card can be programmed to store multiple fingers as a safety feature as well. Using one specific finger on the sensor before use could alert the issuer to an attack, for example. One key differentiator is that the cardholder’s fingerprint is only stored inside the card, not on an external database. The cardholder’s biometric and fingerprint information is safe from hackers attacking companies’ and governments’ databases. These highly personal details live in the wallet or pocket of the cardholder. The cardholder chooses when to use his/her biometric information but is not sharing it with any other organisation. Privacy by design. Let’s not forget the health issues as well. A fingerprint sensor at a fixed terminal (customs, banks, doorways etc) used thousands of times a day can carry germs. But if the fingerprint sensor is on your own card there is no risk of transferring bacteria and germs. Bonus! The benefits of the acoustic channel and battery power add even more value! 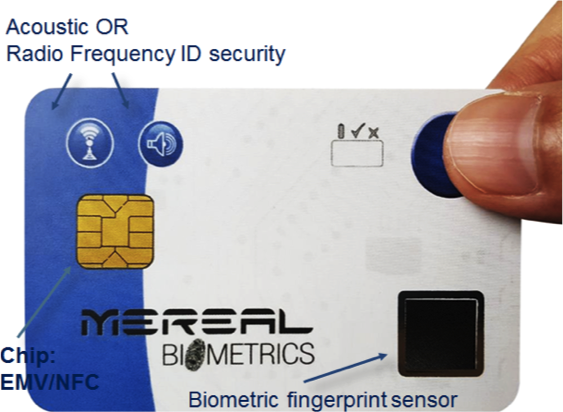 This disruptive, patented, first-to-market technology is available through MeReal Biometrics. Click here to read more about the product.